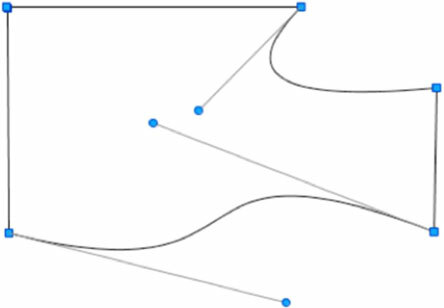 With this function you can create independent and continuous lines, arcs, splines, or any combination of these elements. Click to set the start point, move the mouse to the end point of the line, and then click again. Click and hold the mouse button while moving from the start point, release the button at the control vertex point, and then click again to set the end point. Click on the start point and move the mouse to the endpoint, then click again and hold down the mouse button while forming the curve, and release the mouse button to finish the drawing. 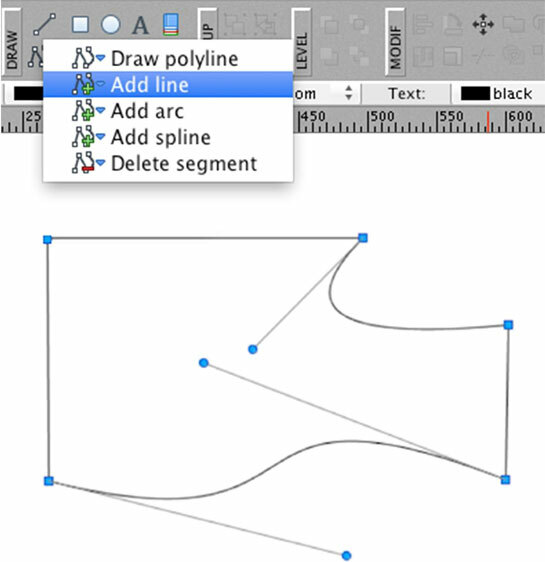 Double-click or press the ESC key to finishing the polyline drawing. When you finish drawing the object, you will see all the control, end, and vertex points, which you can modify. You can add, remove, or delete segments from a spline you have created. Click on the arrow on the right side of the Create Spline / Bezier Curves icon (you can also use the right-click) to display the Options menu. Select a segment you would like to add from the options menu. Click on the control point of the polyline where you want to add the new segment. Select Delete segment from the options menu. Click on the end control point of the segment you want to delete. If this option is active, all the polylines being drawn will close automatically.